If you just copy a few fields from an application and paste them into another application, import sales data from an Excel spreadsheet and fill out an online form, it is already time-consuming, tedious, and error-prone. It is time to automate this process. The question is not if rule-based tasks should be automated, but what does it take to automate them? An Excel macro is a good start, but how can you fill data into another application? Even a simple macro requires programming knowledge, and you do not want to involve your IT department in simple tasks. Many businesses and IT processes are affected by repetitive, rule-based tasks that involve manipulation of the software of various applications. It provides 100% accurate scripts that “see” the presentation layer at the control level. It works with desktop, web, Java, and Citrix apps. It uses Visio-like automation scripts that are easy to create without programming expertise. This automation does not change the underlying legacy applications. It also delivers solutions in days instead of months. Create automation apps and deploy them to all the computers in your department. Record your manual tasks by simply indicating them on the screen, the same way you would train a human user. Trigger automation scripts are used when buttons or links are clicked. 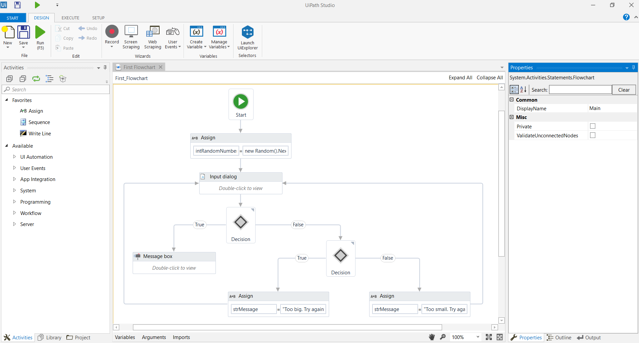 UiPath Studio introduces a visual, declarative way of describing how to automate a process, and business users can use it in the same way they use a Visio diagram. When working with the presentation layer of other apps, you simply indicate on the screen what operation you need to perform. UiPath understands the UI at the logical control level and does not rely on the position of elements on the screen. This makes automation much more reliable and independent of screen size and resolution. UiPath scripts are very visual in nature one can simply take a look at them and tell at a glance what they are supposed to do. It is very easy to maintain them and accommodate small changes in the process. Use UiPath Studio side by side with any other automation package, and you will be able to see for yourself. Salesforce.com, doing a search and generating a report in two minutes. All of this, in just one recording session. UiPath lets you record most of the actions that are possible on presentation layers, including clicks on buttons and links, typing into editable controls, selecting a drop-down menu. It also enables more advanced actions such as waiting until an image appears on the screen or extracting structured data from a web page.